Rubenerd: A midlife crisis… at 22? A midlife crisis… at 22? 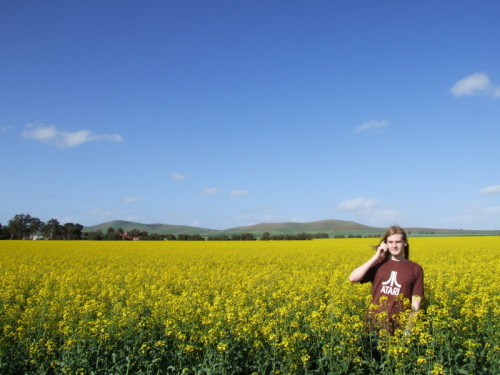 Phone reception in canola fields isn't as good as you would expect. On a more serious note this evening folks. Now that my mum has moved on, I feel as though my primary motivation to succeed in studies and work – to care for her and give her everything she deserved – is gone too. She never hurt anyone, was such a nice person, and deserved so much more. I know it sound cheesy, but it was the most powerful motivation to succeed in the world. Now that a year has almost past, I feel as though my progress in life is slowing down and I have little to no purpose or direction whatsoever. I'm studying and working, but what for? I'm terrified of my dreams, and my idle thoughts. I'm an introvert, and society tells me that's not a good thing. I'm not another lame emo person, I'm just scared of where I am now, and where I'm going, and am questioning my relevance on this planet. I don't know how else to explain it, but I'm sure others understand. I know most people didn't live their childhoods by looking after and out for a parent instead of the other way around, so I know it is possible to have a sense of worth and importance without it, and it's certainly not a conscious decision on my own part to think little of my abilities and purpose, but it still doesn't change the fact that I do. Is it possible to have a midlife crisis when you're 22?